Ninety-nine bottles of beer on the wall. Ninety-nine bottles of beer, take one down, pass it around. And, ninety-eight bottles of beer on the wall. Taking bottles of beer down from the wall is a fun old counting game for kids too young to drink beer. As an adult you can enjoy the luxury of a genuine cold premium drink every once and awhile. You are what you eat, or maybe drink too! So why not dress up as a tasty beverage! Bring out your inner bubbles with a delicious lager, or stout. Or, maybe be a little more hoppy like an imperial pale ale! The best part about dressing up like a beer is you don't have to bring a six-pack to the party! Because you brought a big beer (you) for everyone to enjoy! The Beer Bottle Costume is 100 percent polyfoam. 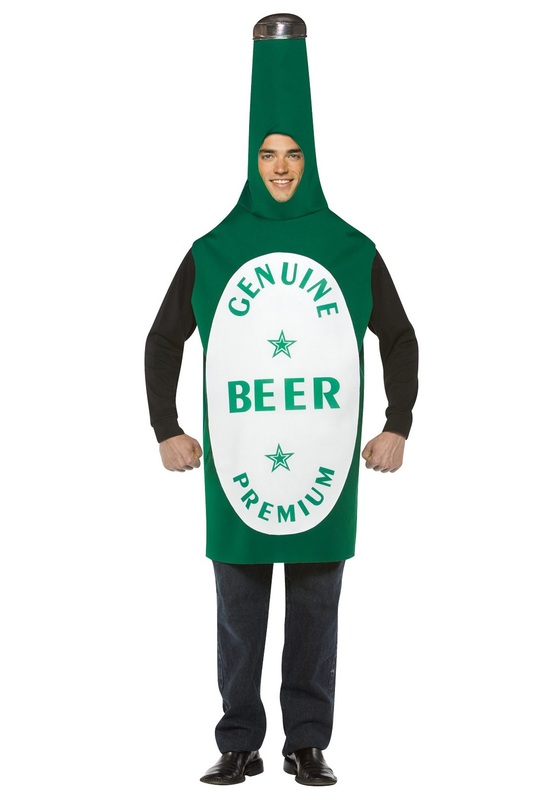 The costume has the words "Genuine Beer" and "Premium" printed a white label. The silver cap at the top is an opening for the head and arms. To create the bottle top appearance you must stuff the top. Get ready to bring the party to any location in the Beer Bottle Costume. Ninety-eight bottles of beer on the wall. Ninety-eight bottles of beer on the wall. Take one down, pass it around. Ninety-seven bottles of beer on the wall. And, the song continues.